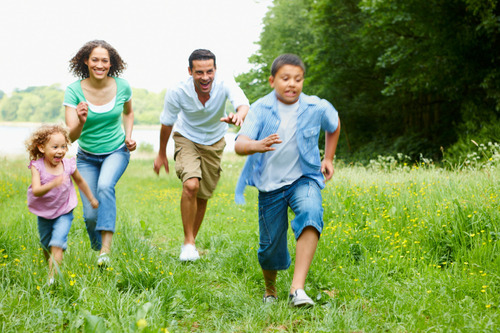 Build a Healthy Home: Make Fitness Fun for the Whole Family! In the coming weeks, our schedules will finally return to normal following the hustle and bustle of the holiday season. With many of us looking to get back on track with healthy eating and exercise, or perhaps start a new plan altogether, we can’t think of a more perfect opportunity to make fitness a family activity. Not only does exercise help prevent heart disease, cancer, and stroke, but it flawlessly complements any healthy eating plan for weight loss or overall well-being at any age. Even more, exercising together will give you and your family the chance to bond over a fun activity that is healthy for all. It is recommended that children get at least 60 minutes of vigorous activity per day to achieve and maintain a healthy weight and prevent a littany of chronic diseases. An hour might seem like a lot of time, but it adds up quickly if you make it fun and interesting and spread it out over the course of the day. Some ideas for promoting an active lifestyle for your little one include encouraging them to join a sports team or after-school activity, taking a family walk after meals, or opting for something active like laser tag, bowling, or miniature golf instead of going to the movies or watching television. Also, feel free to give your children gifts that encourage physical activity such as balls, kites, hula hoops, frisbees, and jump ropes. Be sure to put a cap on their daily TV time, too – you want them outside running around! When the weather warms up, we love the idea of planting a family garden. It’s so rewarding for children to see flowers and vegetables grow after they’ve helped plant them. The garden will also encourage a discussion about healthy eating and where food comes from. Now that you’ve got your family up and moving, make sure that they fuel up for activities and sports. As we’ve mentioned in previous posts, it’s important for children (and adults) to drink enough water before, during, and after strenuous exercise. If your children prefer sweetened drinks, try mixing two ounces of 100% juice or a sports drink with six ounces of water to encourage fluid intake. Breakfast is especially important for growing and active children, so make sure they eat something before rushing out the door. We suggest whole grain cereal with lowfat milk, whole grain toast with nut butter, or a quick and easy smoothie. Fruit such as apples, bananas, and oranges makes the perfect portable snack when days are jam-packed with school and activities. Pair the fruit with a protein source such as nuts, cheese, or yogurt for lasting energy. Be sure to check out our other blog posts for more meal and snack ideas that your kids will love! To learn more about healthy eating plans based on age, gender, and activity level, visitwww.kidseatright.org, or contact a dietitian in your area. Family Food, LLC specializes in pediatric and family nutrition, so be sure to contact us by phone or e-mail if you have any questions. We can also be reached on Facebook and Twitter – can’t wait to hear from you!